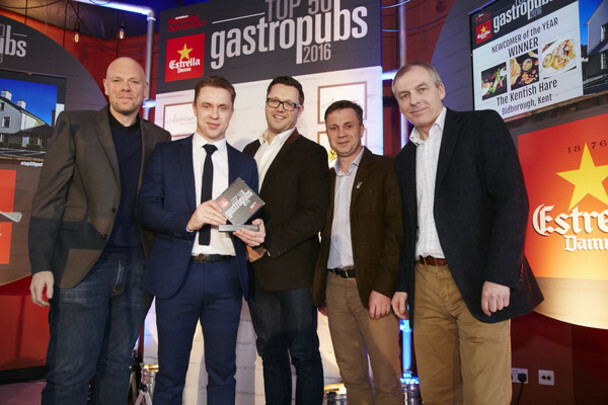 Brothers Chris & James Tanner with General Manager Melvyn Strange pick up the award for Best Newcomer at the top 50 Gastro Pubs awards presented by 2 Michelin starred chef Tom Kerridge. The Kentish Hare also got ranked 33 in the top 50. What an achievment and a BIG well done goes to the team of The Kentish Hare, We wouldnt be here with out everyone of you. Below from left to right Melvyn Strange (General Manager), Chris Tanner, James Tanner, Presenting award Tom Kerridge, Bobby Brown (Senior Sous Chef), Sam Spratt (Head Chef).